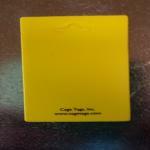 Cage I.D.Tags - Plastic 2" x 4" yellow blank This item on temporary back order from the manufacturer. Cage tags are made from sturdy plastic. You can write on them with permanent marker which can later be removed with grafitti remover. We offer Soy Solve cage tag cleaner for $4.95.